Lambsquarters (Chenopodium album), a common roadside and field plant, is easy on the eyes and useful to boot. A member of the expansive amaranth family, which also includes beets, chard, quinoa, and spinach, lambsquarters can be identified by the telltale dusty white coating on new growth and the undersides of leaves. It’s a favorite among foragers, who mostly gather it for the leaves, which taste like a mild version of spinach. Once you have this wild green in your garden, you may be blessed—or cursed—with it forever. 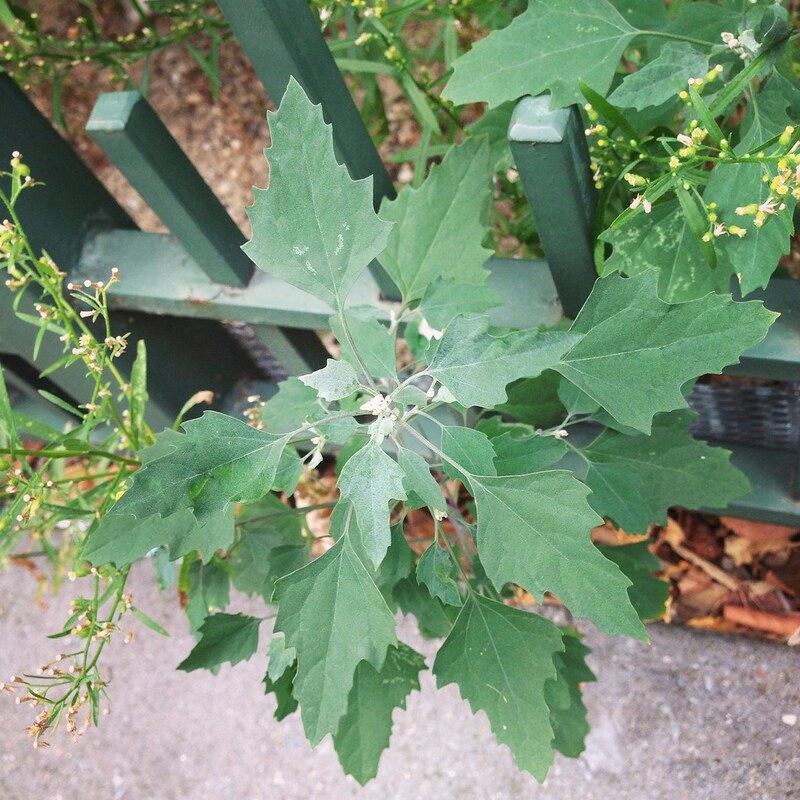 At the Red Hook Community Farm, we have both common lambsquarters and an unusual cousin, Chenopodium ficifolium. They both emerge in one epic cohort, covering huge swaths of the field. Each plant can produce tens of thousands of seeds, the secret to its success as a weed. 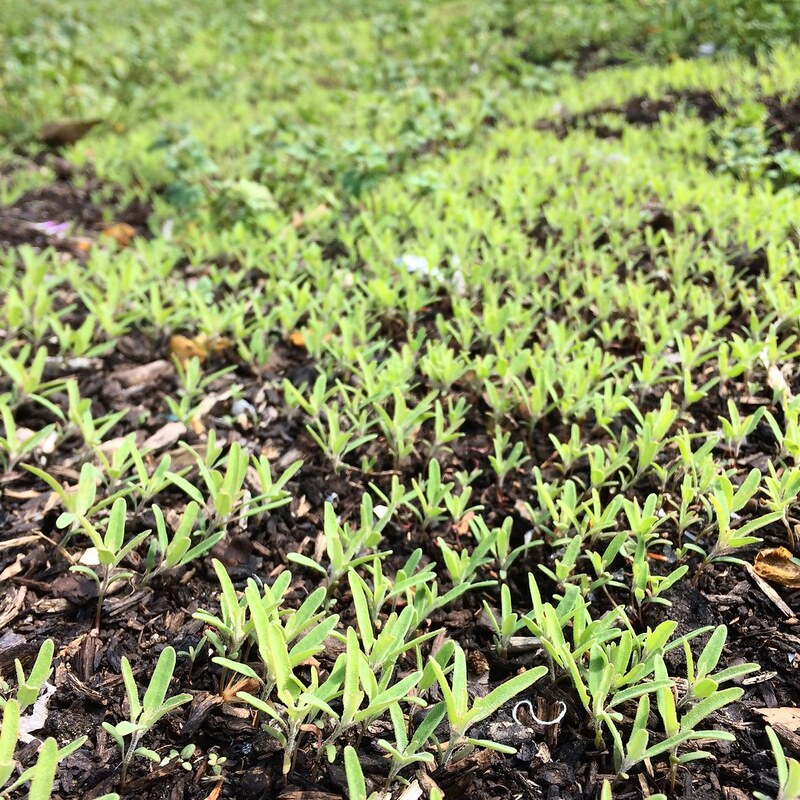 If we don’t pull or plow under the seedlings before they’ve flowered, we’re left to battle with multiple generations in one season. This isn’t the worst thing, as it’s much easier to grow than spinach! We’ve offered bunches of lambsquarters at our farm stand and even include it sometimes in our weekly CSA shares. In many regions of the world, particularly in the Punjab region of India and Pakistan, people intentionally grow lambsquarters as an agricultural crop. The leaves are exceptionally high in vitamins A and C, as well as in calcium, iron, and protein. It ticks all the boxes! You can readily find lambsquarters recipes in foraging cookbooks, from Billy Joe Tatum’s down-home Wild Food Field Guide and Cookbook to Leda Meredith’s posh Forager’s Feast. It’s easy to prepare—no need to parboil or cook for hours—and can be eaten raw, steamed, boiled, or blanched. Unlike other weedy edibles, the leaves retain their mild spinachy flavor and don’t get bitter with age. The seeds similarly serve as a powerful flour additive, porridge ingredient, or bread enhancer. Of course, lambsquarters should only be consumed if collected from uncontaminated soil suitable for growing food plants. The plant also provides a number of ecological services. Its long taproot extends deep into the soil, drawing water and nutrients closer to the surface and allowing more shallow-rooted plants access as well. No wonder you see perfectly healthy lambsquarters growing in the most poor and denuded of soils. Its plentiful seeds provide a nutrient-packed meal for birds, especially in the food-scarce late fall. On the Red Hook farm, our lambquarters patch serves as a “trap crop” by diverting leaf miners, a common pest for beets and chard. 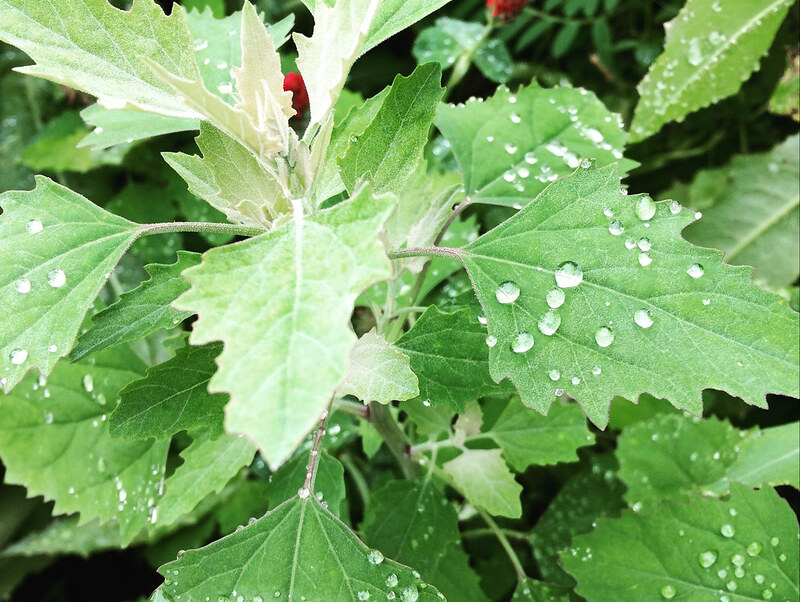 Lambsquarters is also said to have medicinal properties—a poultice from the simmered leaves is used to alleviate achy or swollen joints, and the water left from simmering the leaves may be swished around in the mouth to relieve toothaches! Lambsquarters also teaches us about protogyny, wherein the female parts of the flower mature before the male parts of the flower. This helps the plant receive pollen from another plant (cross-pollination) rather than from itself (self-pollination). This strategy encourages genetic diversity and thus produces stronger, more adaptable plants with each successive generation. Thank you, lambsquarters, for providing a botany lesson and also pleasing our palates! Chenopodium album (lambsquarters) growing in a tree pit. The genus name, Chenopodium, means “goose foot” in Greek, referring to the shape of the leaves. Photo by Saara Nafici. Chenopodium seedling army emerging at Red Hook Community Farm. Photo by Saara Nafici. To the left is an aphid mummy (parasitized aphid), and to the right is a live aphid on a Chenopodium album leaf. Photo by Saara Nafici. 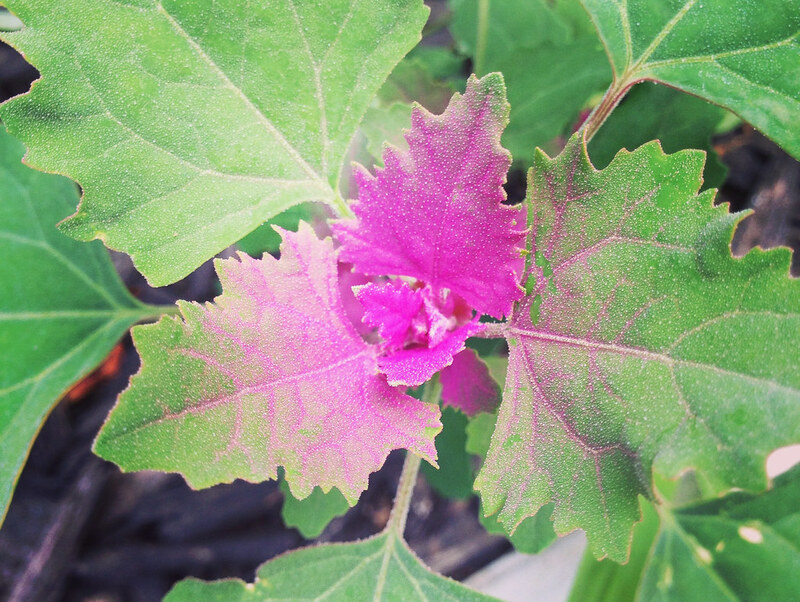 Most lambsquarters plants have a dusty white coating, but some varieties have magenta instead. Photo by Saara Nafici. 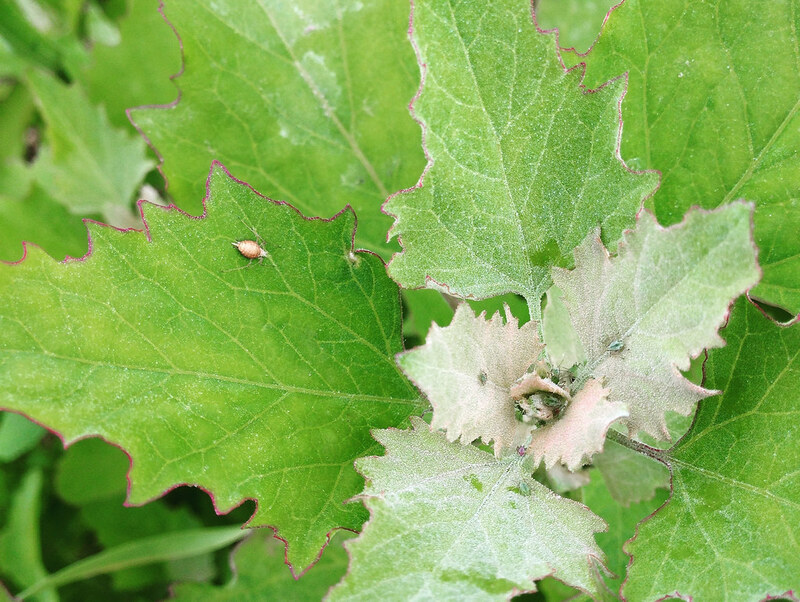 Chenopodium album (lambsquarters) leaves are toothy, triangular to diamond-shaped, and hydrophobic! Photo by Saara Nafici.